I was given very short notice of a mini business dinner meeting my husband sprung on me today. I needed to do a quick clean up around the house, but before that I wanted to get the table ready so I could focus on what I needed to do. I just finished a craft project which is the burlap wrapped vase shown in the center here. I rambled through some of my candlesticks and decided on these. I used my new mirrored tray to add a little glam and reflection. I chose a mix of mercury glass and the rustic finish on the candle holders to go with the burlap wrapped vase that I topped with a boxwood ball. Not too much fuss here, but the Fleur-de-lis Coffee mugs worked beautifully with these scroll designed dishes. The olive green napkins pulled on the centerpiece colors and the hint of green that's in the dish pattern. I kept the neutral tones going with the off white flatware. These people love their coffee so I will be serving plenty of that and if they want some wine the stemware will come into play or I will simply use them for water! Baked Zitti and Ciabtta Bread. I do believe I'm ready.... now off to finish my prepping! Well I got myself right onto making this project that I posted about the other day. Here is the picture of the vase I decided to replicate. I hadn't used Mod Podge since the 70's so I did a little reading up on it and found some simple directions and I decided I could handle. That's my vinyl tablecloth I use for my projects! Here it is drying. I folded the edges to the inside and I created a seam on the back by folding in it's edge. concerned that it was a precise match. I also put some Mod Podge on the jute twine to keep it from moving around and the ends from fraying. played a roll in it too! topiary ball on top of it. I saw this French printed fabric wrapped vase at Michael's and it intrigued me! I'm thinking it would would look charming decorated that way. They folded the top edges in so it would have a nice finished look. They probably used some kind of spray adhesive but I'm thinking that mod-podge might do the job too! I thought of how easy this would be to make but the fabric with the words on it would be the challenge. I wonder if there is some pre-printed fabric at JoAnn's or such? I decided I'd share this just for the fun of it and perhaps it may inspire someone else for a project! I think I'll make a trip to JoAnn's and see what they have! I already own a couple of those cylinder shaped vases so I'm half way there! The other day I decided to make homemade chocolate chip cookies. Once I started gathering my ingredients I realized I had run out of light brown sugar. I didn't want to run to the grocery store and was going to trash the idea. Then I remembered reading that you can make your own! So I Googled it and sure enough there were lots recipes for making your own light and dark brown sugar. I didn't think to look it up in my cookbook but it's probably there too! 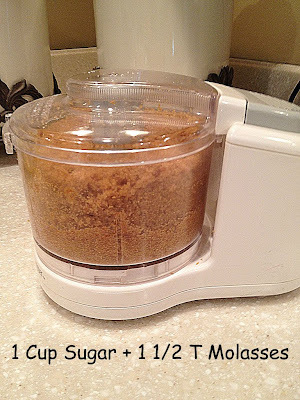 I used my mini chopper to spin the sugar and molasses together. It worked quite well! You could smell the molasses but it didn't taste any different. chocolate chips package. I also used the same mini chopper to chop up the pecans for the recipe. They turned out a little flatter than I wanted (the kitchen was very warm- I think if I had put the batch in the fridge for a half hour it would have made a difference) but the taste is great- I put 1/2 of them into a the freezer. This way they won't go stale and I might think twice about eating yet another one! HA! I'm the original cookie monster! This should put a smile on your face! (Althea, Hibiscus Syriacus) is blooming! It's certainly taken it's time this year to bloom! Actually I am glad to know it's alive and seeing it bloom was a nod to the fact that I didn't kill it last year when I gave it quite a cutting back! There are a lot of buds yet to open but they are all facing the neighbors house! I figured I better take a picture before I forget to! You'll notice the bumble bee was visiting too! The flowers are a purplish blue double bloom. The Stella D'Oro lilies are blooming again, but of course not as prolifically as the first time. The Russian Sage has a very wild look to it this year. I think they prefer to be planted in a spot where they can be on their own. At least is smells good! Smells good too! We have leaves dropping here and there....the fall season won't be long! Very mixed about my plants I chose this year. I need a better plan next year! The arbor has Sweet Autumn Clematis...no blooms yet...and Morning Glories growing with no flowers too! What gives?? Along the path some hostas with unusual flowers! got a sprinkling of Osmocote as they were planted. Lastly, my planters in front of the garage took off rather wildly! The Sweet PotatoVine really got a run on and has just about taken over! I do like the red Supertunias...they made a good show. One of the bloggers I follow Cabin & Cottage left this sentiment on a beautiful post she did- it grabbed my heart strings and expressed my sentiment! When the season finally changes, it will be sweet and a bit sad. I will want to hold summer tightly for a moment as you do with a loved one when you wish you could stay forever. Already waiting, though not idly, until the next time you meet. . . .